By “arc” I mean a topological embedding of the unit arc into or . If the embedding is chosen to be smooth or piecewise linear, there isn’t much to do since all such embeddings are ambient isotopic to a standard, boring linear line segment. But if we even allow for as much as a single wild point, then weird things can happen. It is probably best to procede with some examples. 1. Not all “wild looking” arcs are wild. 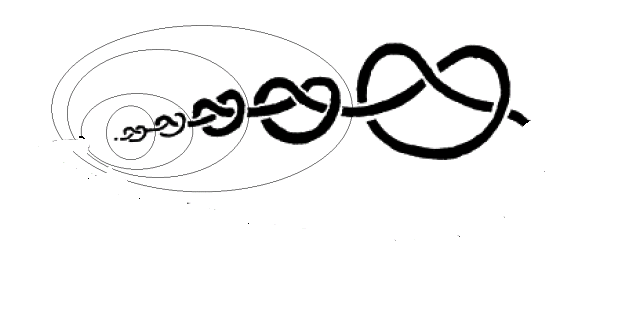 The arc in the upper left hand corner IS wild and the arc in the lower right hand corner (which is supposed to represent an infinite series of trefoil knots, each tied smaller and smaller and converging to a single point) is NOT wild. The ONLY points that are moved are those between the boundaries of and . Denote this orientation preserving homeomorphism by . We can now define a homemorphism of 3-space by if and otherwise. This takes this arc to a straight arc. Note: if we took this “almost wild” arc and added even a slight arc “past” the endpoint, then the above procedure would fail. A wild arc that is the union of two tame arc is called mildly wild. 2. An arc that has only one wild point has a simply connected complement, even though the arc is wild. The idea of a sphere surrounding a wild point having to hit the arc in a set number of points is called the “penetration index” of the arc. More on that for a subsequent post; a good reference is: 24), : W. R. Alford and B. J. Ball, Some almost polyhedral wild arcs, Duke Math. J. 30 (1963), 33-38. MR 26 # 1858. Note: some wild arcs have a wild point with an infinite penetration index. Let be a closed loop (say, a smooth or piecewise linear one) that misses the arc. Two compact sets in a metric space that miss must remain at least some set distance from each other. So enclose the endpoint of the arc by a ball of radius and it is easy to see that bounds a disk that misses that ball. But that disk might hit the arc in a finite number of points. But that is no problem because those points are tame points of the arc; they are outside of the ball that contains the only wild point. That part of the arc can be enclosed by a tube (called a tubular neighborhood of the arc) that runs to the non-wild endpoint of the arc. That neighborhood can be used to construct “caps” that run around the tame endpoint of the arc; in that way the original disk that bounded can be replaced by a new disk which has “feelers” which push past the tame endpoint of the arc. Now this proof works for an arc whose wild point is at an endpoint; the same idea works if the solitary wild point is not an end point. Note: the fundamental group of the arc complement maps non-trivially onto a subgroup of the alternating group (the same one you studied in your abstract algebra class). Note: this arc has two wild points. 4. It is possible for two disjoint wild arcs to “link”: that is, be situated in a way so that the arcs are disjoint but also so that there is no sphere which encloses one arc but not the other. Example: image two copies of the Fox-Artin arc shown above, but in the middle “stitch”, link the two middle strands. Now if there were a 2-sphere separating the two arcs, it would have to miss each arc (and therefore the 4 wild points) by some distance . So surround each of the 4 wild points with a smooth sphere of radius, say, . Then one can obtain two disjoint graphs; each of these graphs is equal to the respective wild arc outside of the ball bounded by the sphere, and inside the balls we can just connect the non-wild parts of the arcs (the parts outside of the balls) by smooth arcs inside of the balls; hence in a sense, we have approximated the two disjoint wild arcs by two disjoint smooth graphs which are equal to the wild arcs outside of a small neighborhood of the wild points. 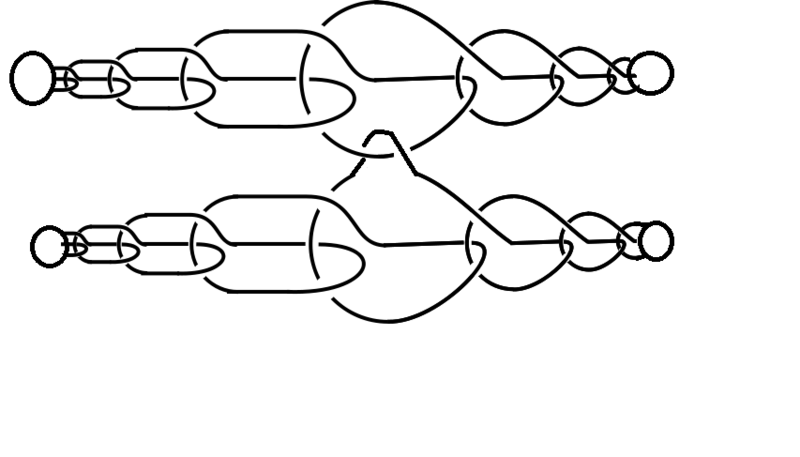 It is easy to see (via standard algebraic topology or by classical knot theory techniques) that these two smooth graphs are NOT splittable. Hence the two wild arcs weren’t splittable either. Note: we have just skimmed the surface of wild arc theory; there is a lot out there. T. B. Rushing, Topological Embeddings, Academic Press, (Pure and Applied Mathematics, Volume 52) 1973, Section 2.4. The edition I have is out of print; I linked to the newer one. property. The examples depend heavily on a recent result of McMillan. cannot be slipped off B. This strikes me as very non-intuitive; you’d think that higher dimensional space would provide “more room” for maneuver but it also provides more room to introduce pathologies as well. To see the beast of an arc that Wright is talking about, here is D. McMillan’s article (open access PDF) about an arc that is so pathological, it doesn’t have a neighborhood inside a manifold that embedds in any . Of course, this neighborhood cannot be a manifold because of the Whitney embedding theorem. Thank you. Note: I think that the “spam detecting” software noted the link and put your comment into the “questionable” bin. Offhand, would a sequence of alternate-chirality trefoils be wild? Or randomly varying chirality trefoils? if you mean an “infinite sequence”: yes. Remember that knots can’t cancel each other. Now DISTINGUISHING “different” sequences of trefoils of varying chirality: that would be nice research problem. How can one make a wild knot? Wild Arcs with simply connected complements: two examples.